Firefighters | Heathcliff, For Why? Chronicling The Ridiculous Antics Of The Other Orange Cat. Never Forget To Do Your Job. 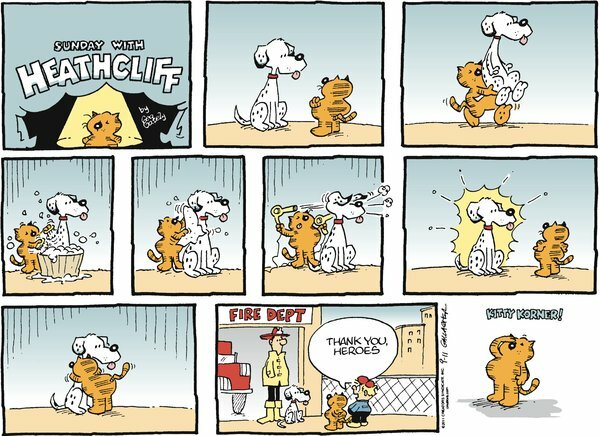 On 9/11/11, we saw the only post 9/11/01 Heathcliff comic that was about the 9/11. That’s a nice sentiment but the first-responders in Heathcliff aren’t that heroic. They never do anything to stop Heathcliff’s crimes. Here, Heathcliff is stealing food and the two police officers don’t do anything. They’re just like, “Oh, cool, a cat on a bike.” Westfinster tax dollars at work, folks! Yes, the town is called Westfinster. Also, a cat stole a dog from a fire station without anyone noticing or protesting, including the dog. Dogs are dumb and Heathcliff is ridiculous. Never forget. You can find me elsewhere. Newest Additions To… on Get Your Own Damn Dinner. Newest Additions To… on Hey Helmet. Garbage Ape Without… on Heathcliff Without Heathcliff.